For those of us in a sewing or craft business, we try to think of gifts for others that may be sewing related. Making craft items, clothing items or home decor items are all great ideas, but sometimes I want to be a little more “creative” in the gift I give. Of course, the gift must be something the recipient would really want, and not just be a “white elephant” for them. I want to give you a couple of ideas that I’ve done in the past that were really appreciated by those that I gave them to. A few years ago the associate pastor’s wife at our church was big on sewing — in fact she sewed nearly every stitch of clothing she and their four children wore. The gift for her was really a no-brainer — give her stuff that I would like to have! I bought a nice basket then began filling it with spools of various basic colors of thread (white, navy, black, brown, red, etc), added a few 1-yard lengths of interfacing (different weights), a few packages of 3/4″ and 1″ waistband elastic, along with a few other sewing notion items then topped it off with a copy of the Sewing Machine Repair For The Home Sewer book. She LOVED the gift and over the course of the next few months she’d tell me what she’d been using, and that the repair book had kept her machine out of the repair shop, each time telling me again how much she liked the gift. One year I had grandchildren that were just getting into the perfect age to start teaching them to sew, so I took the opportunity to give them a “sewing related” gift that we could all work with together later in a little sewing class. I bought some children’s fabrics (2 or 3 pieces to start with), then added some sewing supplies I knew they’d need (scissors, marking chalk, package of pins, package of hand needles, t-square, measuring guide), then again topped off the gift with a copy of the Learn How To Sew book. We would be using the Learn How To Sew book as part of our sewing class, so I wanted it to be part of their gift. 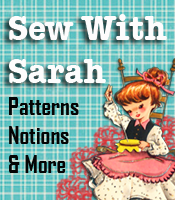 If you don’t have a fabric store nearby, I’ve seen some excellent sales at JoAnn’s online, and Fabric.com online. The point is to have everything ready so you can begin a little sewing class for them right after the Christmas Holiday. What kind of sewing related gifts have you given, or are thinking about giving to someone this year?